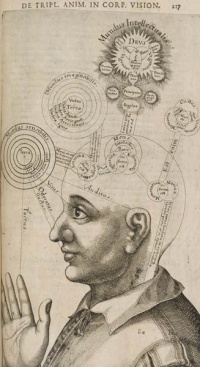 Utriusque Cosmi, Maioris scilicet et Minoris, metaphysica, physica, atque technica Historia (The metaphysical, physical, and technical history of the two worlds, namely the greater and the lesser) is a book by Robert Fludd, published in Germany between 1617 and 1621). Illustrations are by Jean Théodore de Bry and Matthäus Merian. The often shown engraving of that book, the Theatrum Orbi, is by Jean Théodore de Bry. It depicts a scaenae frons, five doors and a bay window. On the bay window are inscribed the words "THEATRUM ORBI." According to Frances Yates, Fludd's memory system, which she describes in detail in The Art of Memory, may reflect the layout of Shakespeare's Globe Theatre. Theatrum appello illud, in quo omnes vocabulorum, sententiarum, particularum orationis seu subjectorum actiones tanquam in theatro publico, ubi comoediae & tragoediae aguntur, demonstrantur. "I call a theatre [a place in which] all actions of words, of sentences, of particulars of a speech or of subjects are shown, as in a public theatre in which comedies and tragedies are acted." Unless indicated otherwise, the text in this article is either based on Wikipedia article "Utriusque cosmi maioris scilicet et minoris metaphysica" or another language Wikipedia page thereof used under the terms of the GNU Free Documentation License; or on original research by Jahsonic and friends. See Art and Popular Culture's copyright notice. This page was last modified 08:19, 15 June 2014.